There are many similarities between Santiago and Los Angeles — they share the same climate (mild and dry) and progressive, cosmopolitan energy. And both of these major cities are close to stunning beaches, wine valleys, mountains and major astronomical observatories. You might call Santiago the Southern California of South America. Santiago's must-see landmarks are the Metropolitan Cathedral and Pre-Columbian Art Museum, but apart from the churches, museums and palaces of central Santiago, every visitor needs to experience the places that enliven the city — the markets, parks and neighborhoods. Central Market houses a legion of vendors and food purveyors inside a cavernous hall built in 1872. The National Zoo and an iconic hilltop Virgin Mary statue can be visited in Metropolitan Park. Barrio Italia (hip hotels, galleries and cafes) and Providencia (excellent restaurants and bars) are top neighborhoods in this city. Both day and night, Santiago is a walking city made for exploring. Beach towns and seaside resorts line central Chile's Pacific coast, some within an hour of Santiago. Notable are the quiet village of Isla Negra, where poet Pablo Neruda's former home is now a museum, and the bustling beach resort city of Vina del Mar, brimming with high-rise hotels and casinos. But the highlight of any coastal foray is the colorful and historic city of Valparaiso. Only one hour from Santiago, the city of 300,000 is home to seven universities and 15 funiculars that climb the steep hills that characterize the city. Some of the best Chilean wines are made just outside Santiago in the Maipo Valley. Wine tourism there is as robust as the cabernet sauvignons poured in the valley's numerous tasting rooms, and it's possible to visit several wineries on a single day trip from Santiago to Maipo or one of several other nearby wine valleys. It's best to take a wine bus so that you can taste at several wineries without having to worry about driving after, and the views of the nearby Andes from some of the wineries are just as spectacular as the wines. If you prefer stargazing to wine tasting, you can head north to one of the many observatories in Chile, regarded as the best collection of them in the world. Using Santiago as your launch pad to the stars, consider stops to see the ALMA Observatory (the world's largest astronomy center), the visitor-friendly Mamalluca Observatory and the Very Large Telescope (VLT) at the Paranal Observatory. The cold, dry, usually cloudless night air makes these spots ideal for stargazing. On July 2, you can even see the stars before dusk as that's the date of the next total solar eclipse and northern Chile is the best place to experience it. Observatories are located within a few hours of Santiago, too. The Andes soar skyward so close to Santiago that you can drive or take a tour bus right over them (via a 9,000-foot pass) to the Argentine wine city of Mendoza and back in one day. The twisty trip is a treat as you'll see two great wine regions and one great mountain range in a single day. Adventurous travelers may prefer to lengthen the trip by stopping to stay overnight at Portillo, one of several ski resorts within a few hours of Santiago, to enjoy skiing or hiking, depending on the season. Chile boasts the top safety rankings on the continent. It's also easy to get around. Taxis, subways and Uber are all good options at the airport and in Santiago. For trips to the beaches, wineries, the Andes or Valparaiso, it's best to reserve a tour bus so you can enjoy the scenery and meet fellow travelers rather than stress over directions and traffic. Also, auto rentals in Chile are pricey. If you're looking to visit during Chile's summer, remember it's between December and March. But the best times to visit are late-September through November or March through May when you'll experience the typical mild temperatures, but thinner crowds and affordable prices. 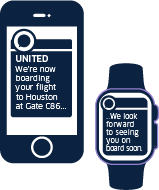 United flies nonstop from Houston to Santiago – though there are flights from multiple cities to Houston. Reserve your flight at united.com or on the United app.